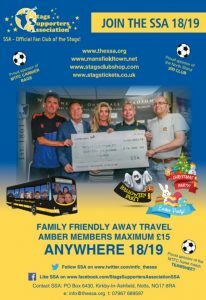 Stags Supporters Association (SSA) are the voluntary ran Official Supporters Club of our beloved Mansfield Town FC and launched on 15th July 2001 after a merger between the two major supporter groups of Mansfield Town FC at the time, Stags Supporters Club (SSC) and Support Our Stags (SOS). SSA have recently celebrated not only 17 years of voluntary fund raising for Mansfield Town but as SSA we have also celebrated 15 years of organising family friendly away travel to EVERY competitive Mansfield Town match ANYWHERE in the country. Amber Members for a second season running can travel away ANYWHERE in the U.K for just £15! SSA have raised well over £100,000 for our club over this time. There are three membership categories, Amber, Blue and Junior. The Amber category is terrific value for those who can, and wish to, put that bit extra in to help the club and new for this season is lifetime Amber Membership. The Blue category is where the membership fee is used to cover the cost of administration etc. Finally, the Junior membership ran in partnership with the Mansfield Town Football In The Community Department provides a wonderful service for young fans, with all registered members of the junior section receiving a signed birthday card from the Stags Squad! SSA Amber Membership is the Ultimate Stags Fan Club membership designed for those who can and want to put in that little bit extra to help the football club and its fans. The Minimum Membership Fee is just £4 a month or £1 a week. There are many fabulous Exclusive benefits to be enjoyed by Amber Members in addition to those enjoyed by Blue Members. Minimum £48 per year by cash or cheque – SSA will gratefully accept higher donations! If you are paying annually, please enclose your cheque, if you are paying by standing order please check the relevant box. Download the application form above, complete and either post it to us along with a cheque or pay online via our shop and e-mail the application form to the SSA at membership@thessa.org. SSA Junior Membership is available to all Stags fans Under 16 as at 1 May 2018 and is £5 for 18/19 season. *Birthday Card signed by the Stags Squad! *£5 Discount off MTFC Football In The Community Stay All Day Club!